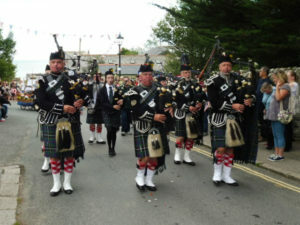 Kernow Pipes and Drums undertake engagements all over Cornwall as well as further afield. We are available for Carnivals, Parades and Festivals and have also played at weddings, funerals and private functions as a band and also in smaller groups. Some of our players are available as soloists and duos for events such as Burns Nights. We also play in various massed band gatherings such as Bideford Massed Bands and the Operation Market Garden commemorations in Arnhem. To enquire about booking Kernow Pipes & Drums for your event, contact our booking secretary. You can also get in touch via our Facebook page. For quick reference, potential bookers can see all engagements to which we are already committed shown on this page. These are some of Kernow Pipes and Drums’ engagements for 2019. PLEASE NOTE WE ARE NOW FULLY BOOKED FOR SUMMER AND AUTUMN 2019.